This is my first January as a blogger and it felt like a perfect time to share my 2017 goals. I was inspired by Jamie Jeffers’ goal updates in 2016 to do the same here in 2017. To increase my odds of success, I am going to use the S.M.A.R.T. goals model. My goals for the blog mostly center around increasing the traffic. My purpose for writing this blog is to get the word out to people about saving money and budgeting. I can’t do that if they’re not coming to the site! I’ve read that getting from 0 to 10,000 page views per month is the hardest hurdle. Once you get past that point, traffic grows exponentially. My big goal is to reach 10,000 monthly page views by December 2017! December 2016 Goal: 1,500, Actual: 3,201! December was my best month ever. Maybe I should have made these goals higher! Email List: 200 subscribers. If you’re interested, sign up here for my email list. Facebook Likes: 350. If you’d like to help me reach this goal, please like my Facebook page. Pinterest Followers: 5,000. If you’d like to help me reach this goal, please follow me on Pinterest. Videos: Conquer my fear of video and publish at least 1 video per month in 2017. Networking: Attend FinCon personal finance blogger conference in October 2017. Plan, save up for, and go on a 15th wedding anniversary celebration trip. I can’t believe we are approaching our 15th anniversary this June! We’d like to celebrate it in some way, but haven’t decided what we want to do yet. Monthly parent/child one-on-one “date”. I want to start a monthly tradition of “kid dates”, where each parent takes one child out to do something fun. Our two kids are very close in age and I feel like they are always stuck doing things together. All they really want is some individual attention from a parent. Some of these dates will cost money, but I hope we can do some free ones too, especially in the warmer months. This list of parent/child date ideas from Raising Lifelong Learners really inspired me. Replace upstairs carpet. The carpet on the stairs and second floor of our house is 25 years old. It is WORN OUT. I’ve wanted to replace it since we bought this house 8 years ago. Our sinking fund for the carpeting is almost fully funded. Now we just have to do the hard work of actually getting it replaced! 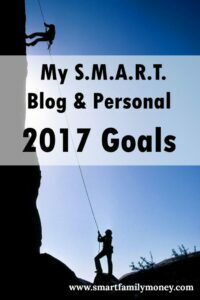 I think it’s a little funny that I’m a personal finance blogger and none of my personal goals relate to saving money. In fact, they will all require spending money. We will continue to fine-tune our budget and savings, but we have the big stuff under control. We’re debt-free other than our mortgage, have a fully funded emergency fund, have healthy sinking funds for many future needs, and we’re saving for college and retirement. While I will strive to keep our finances healthy, I also want to focus energy (and money) on the things that really matter to me in life: my marriage, my children, and creating memories together. Do you have some goals for 2017? I’d love to hear about them! Please comment below! Thanks! I may edit my goals in a couple months if I can keep this momentum going. They seemed like reasonable goals a few weeks ago and then December was surprisingly successful! Thanks for the encouragement!